IDENTA LC Microhybrid Composite is a light-curing microhybrid composite based on IDENTA’s special glass ceramic filler structure. This radiopaque filling material is universally usable for both the anterior and posterior areas as well as the inlay technique. IDENTA LC Microhybrid Composite contains 77 % (= 56 % by volume) inorganic fillers, microfillers (0.05 µm approx.) and small particle fillers (average particle size 0.7 µm). The monomers consist of Bis-GMA, UDMA and TEGDMA. IDENTA LC Microhybrid Composite can be polished to a perfect high gloss and has a chameleon effect, i.e. natural translucency for shade adaptation. IDENTA LC Microhybrid Composite cures under blue light. 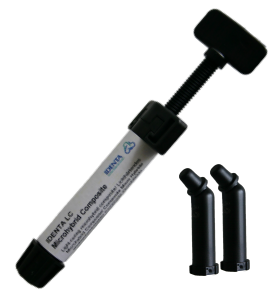 IDENTA LC Microhybrid Composite is available in practical syringes and as IDENTA LC Microhybrid Composite Caps for the direct application (Composite Application System).